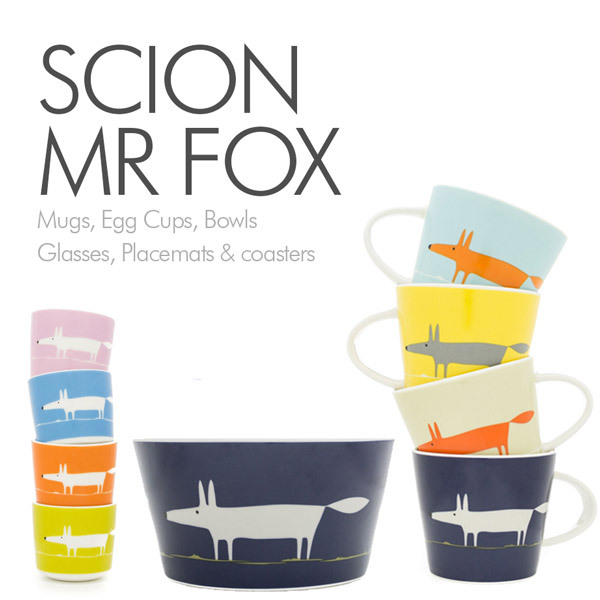 Famous for the Sukie notebooks, the new Sukie range of designer earthenware mugs feature their cute animal illustrations, including a quirky bear mug, fox mug, wolf mug, racoon mug, squirrel mug, dog mug, cat mug and owl mug. Sukie, a brand inspired by nature, folk art and printed ephemera collected from worldwide travels, was created by designer and illustrators, Darrell and Julia. Now based on the South cost near Eastbourne, Darrell and Julia both grew up away from the sea although have always been imaginative and creative. Darrell was a Hertfordshire boy who enjoyed spending his days digging around for creepy crawlies, making models and painting his fantasy figures. Julia was raised in North West London and loved nothing more than drawing, typing stories on an old typewriter and making useful items out of sellotape and paper – her greatest achievement… an entire doll’s house complete with furniture and characters! Both Darrell and Julia went to the University of Brighton to study for a BA in Illustration which is where they met. Following university, Julia began working as part of the buying team for stationary and gifts at House of Fraser and Liberty whilst Darrell went on to do a MA at The Royal College of Art. For his graduation show, back in 1999, Darrell exhibited a wall of handmade notebooks as the centrepiece. These notebooks were made from various papers that he had collected over the two years of his course… envelopes, scrap paper, unwanted artwork and packaging, all destined for the recycling bin. Darrell started by constructing sketchbooks for his own use but by the time of his graduation show, Darrell had amassed quite a number of notebooks. When put together on the clean white wall of the exhibition, he realised he had created an appealing product and SUKIE was born. He expected to sell a few during the show however his notebooks received incredible interest from some prominent stylists and buyers. The rescued paper notebooks ended up in top boutiques in London and New York and home store Habitat placed an order for 24,000 and commissioned a line of stationery. It was at this point, in 2000, Darrell teamed up with his then girlfriend (now wife), Julia, to set about fulfilling these large orders. Following an incredibly successful trade show in 2001, where Darrell and Julia first met MAKE International’s Keith Brymer Jones, Sukie exploded in popularity and now has a vast collection of quirky printed textiles, stationary, gifts, homeware and fashion which they sell across 20 countries worldwide. MAKE International have worked collaboratively with Sukie to develop the first ever Sukie Animal Folk ceramic range featuring their cute & quirky bear mug, fox mug, wolf mug, racoon mug, squirrel mug, wolf mug, cat mug and owl mug. MAKE International’s Head of Design and renowned ceramicist, Keith Brymer Jones, loved Sukie’s story of rescued paper, the earthy, natural aesthetic look of the brand and its potential as a fun new range for MAKE. The new Sukie mugs are made from stoneware high in iron so when they are fired they produce a warm, organic feel in keeping with the Sukie brand. Each mug features one of Sukie’s friendly forest characters bear mug, fox mug, wolf mug, racoon mug, squirrel mug, dog mug, cat mug and owl mug all with a trendy exposed glaze line and the embossed Sukie stamp. Nowadays, Darrell and Julia work from their studio on the South coast continuing to innovate new styles of notebook using different printing techniques. They’re inspired by the antique printing equipment and book presses in their studio and their huge collection of reference books and ephemera, mostly picked up in flea markets and second-hand bookstores. Outside of work, Darrell and Julia have a Sukie family – three children and a labradoodle – who all live just outside of Eastbourne in their 1930s house with beautiful views of the South Downs National Park. They all enjoy family walks, going rock pooling at the local beach and exploring flea markets.